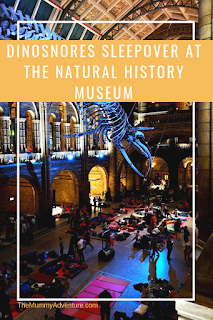 I don't remember exactly when I first heard about Dinosnores, the sleepover at the Natural History Museum in London, but I thought it would be the perfect way to spend some time with my then six year old and I booked in to go in November once he was seven. 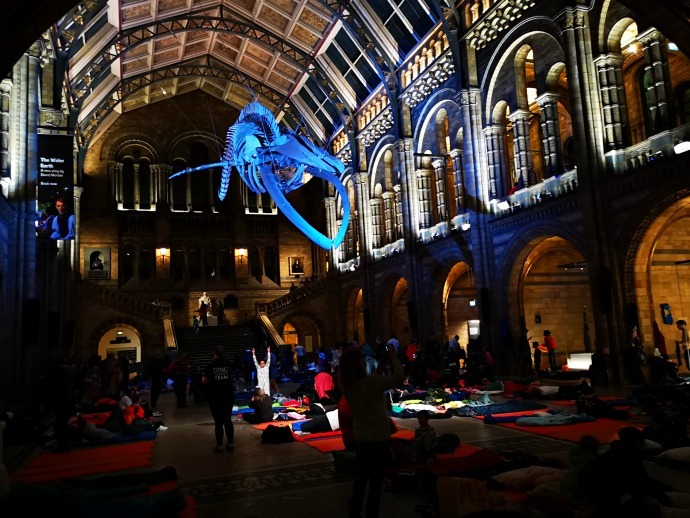 Dinosnores is a sleepover experience for children aged 7-11 years that takes part after the museum has shut for the night and involves sleeping under the great blue whale skeleton in the extraordinary Hintze Hall. 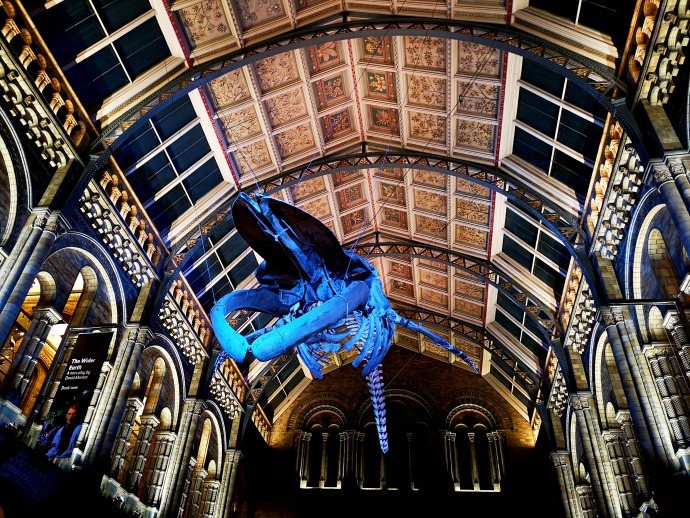 We arrived at the Natural History Museum at 6:45pm in the rain and were assigned our team (blue raptors) and shown an area of the main hall covered in sleeping mats so we could choose our beds. 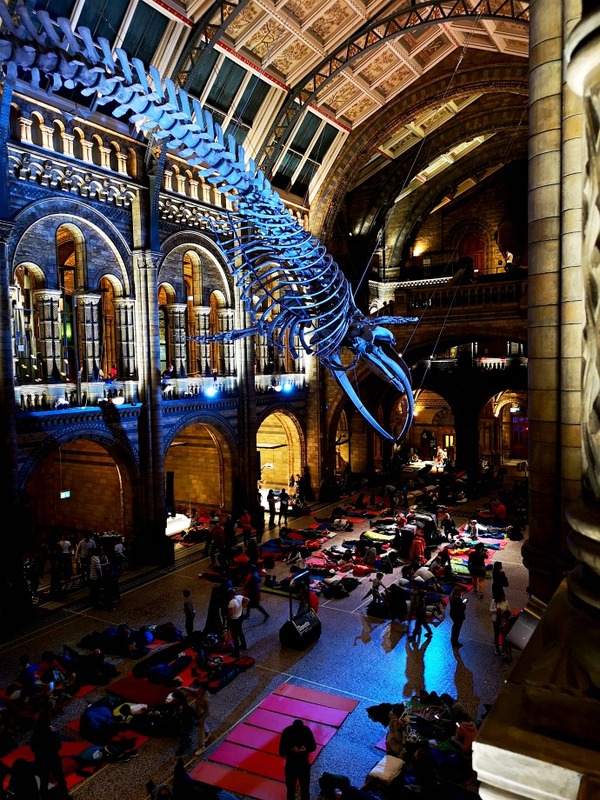 There was an excited atmosphere as the children laid out their sleeping bags and browsed the animals and skeletons that line the main hall. There was plenty of time to go and change into comfy clothes (most children were in either warm pyjamas or a onsie for the evening) and have a drink. There were three evening activities and different groups did them in a different order. 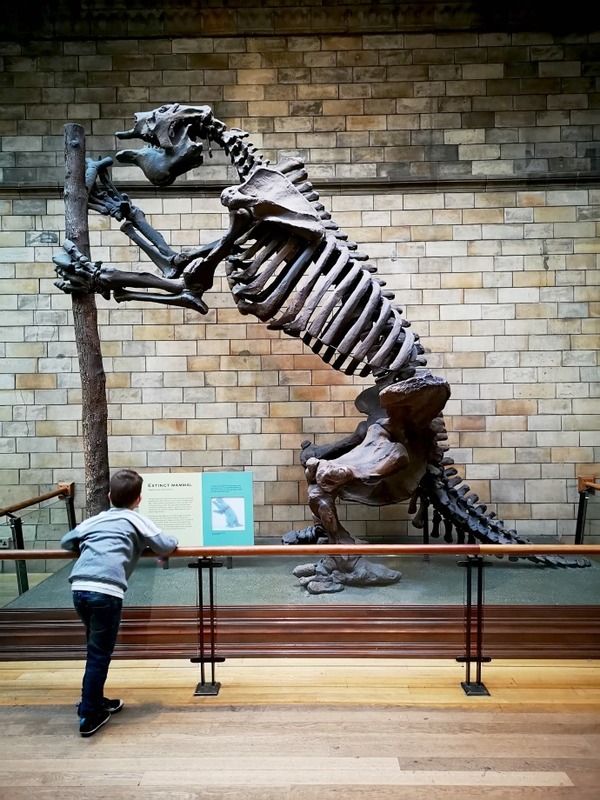 I was worried that Dylan wasn't 'into' dinosaurs enough for Dinosnores but I loved the way the activities meant you didn't need to be (although a light interest is quite useful) as you could focus on the other aspects of the activity instead. 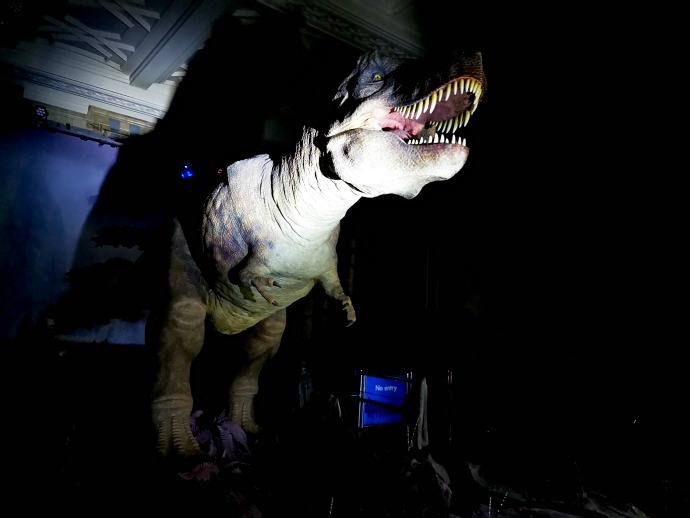 Our first one was a torchlight trail around the dinosaur area finding the clues to find out our Dino. The children were all given torches and sheets and Dylan loved looking for the green dinosaurs to complete his sheet and learning some facts about the answer. After this we could go to the Natural History Museum cafe for a snack. You need to bring in your own food which has to be kept in the cafe at all times and there was tea and coffee on hand too. We had eaten dinner before we arrived so had some light snacks to get us through the rest of the evening. After snack time was our second activity. 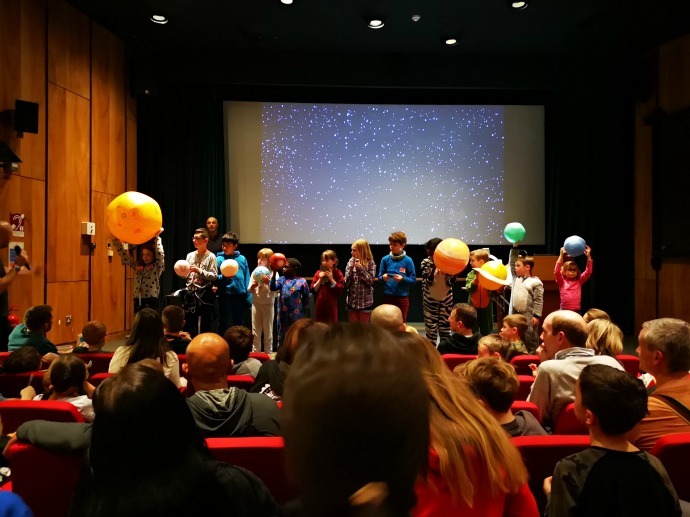 The event says children must be between 7 and 11 to participate and it was the science show that we watched next that really showed me why. 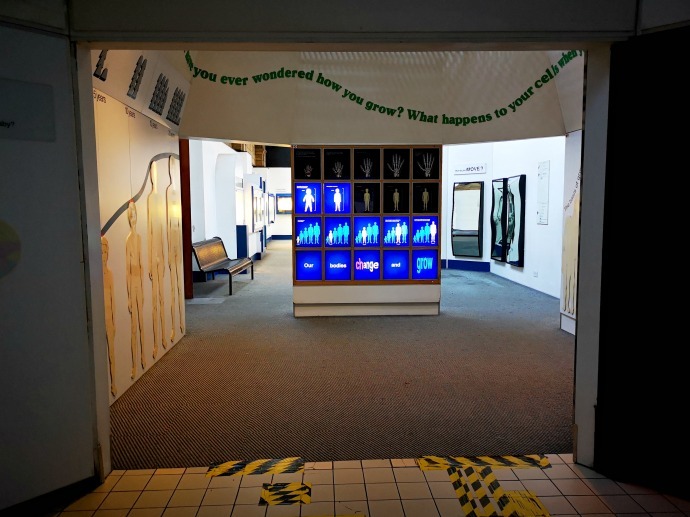 It started at 9.30 and was incredibly interesting and interactive but it was pushing the limits of Dylan's concentration to engage in a show at that time of night. 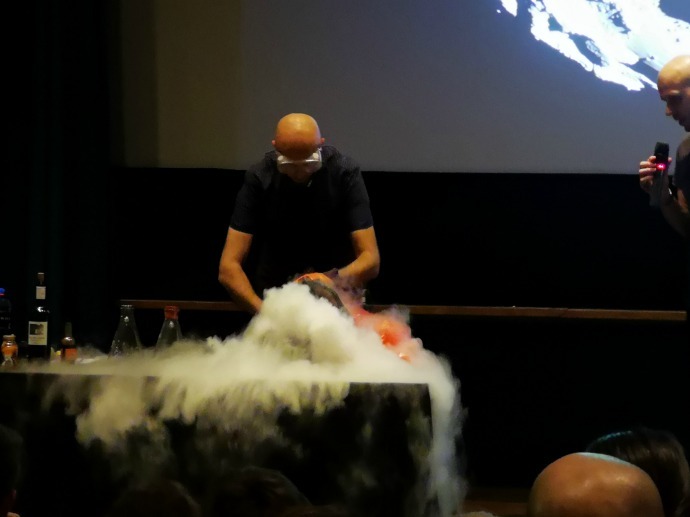 It was run by Scientists from the museum and was fantastic. 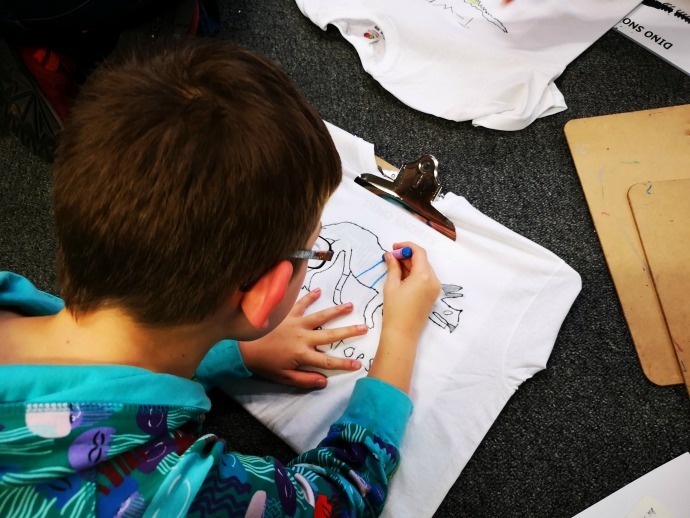 Our final activity for the evening was creative and the children were taught how to become dinosaur artists, interpreting the fossils to discover how the dinosaurs would have actually looked and it ended in them creating their own t-shirts to take home. I was so impressed with how this activity was run as there was plenty of space and materials and all the children looked really involved. Dylan loves art so I think this was his favourite t-shirt and my job this evening is to iron the t-shirt to secure his art on it!. We went back to the main hall afterwards to prepare for lights out at midnight and got cosy in our sleeping bags. 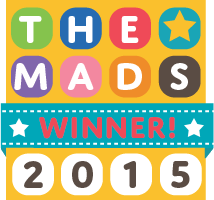 Thankfully it wasn't cold despite the pouring rain outside and once the lights went out it was very dark. Sleeping on the floor isn't the comfiest though and whilst Dylan got a full seven hours I certainly didn't (and I hadn't expected to). 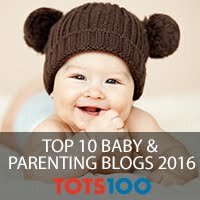 He is a child that needs a lot of sleep so the next day was quite challenging by the end of it despite his hour long nap on the way home! Lights came up at 7am ready for breakfast and there were small packs for each of us with a small muffin, a yoghurt and juice. I would definitely recommend packing something more substantial like croissants/pain au chocolate of breakfast bars as we were still hungry and unprepared. After breakfast there was a live animal show featuring a skunk and a meerkat amongst other things. It was really well done with humour for the adults alongside interaction for the children. Once the sleepover officially finished, we were left to either leave the museum or stay in it and some exhibits were open (and of course empty) so we could enjoy them in peace before the crowds arrived! 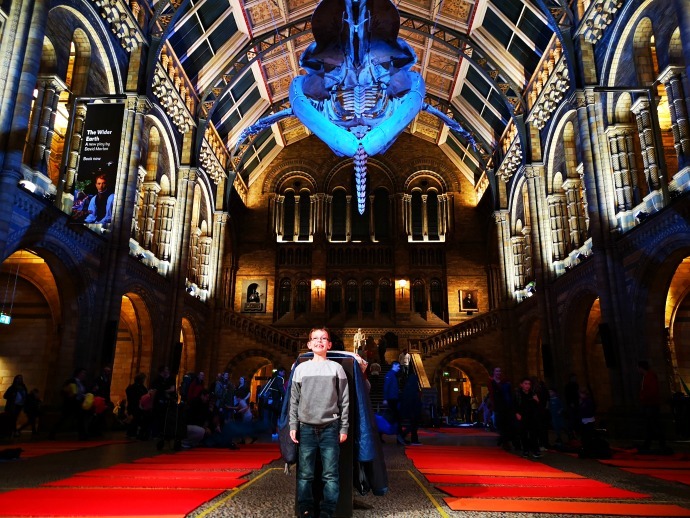 The event was organised amazingly and there were so many staff on hand at the Natural History Museum who could help return lost families to their group, guide the activities and chat to the children. If I had a question there was always someone close by to ask it too and all the staff were enthusiastic and knowledgable. I was really impressed with how well run it was. 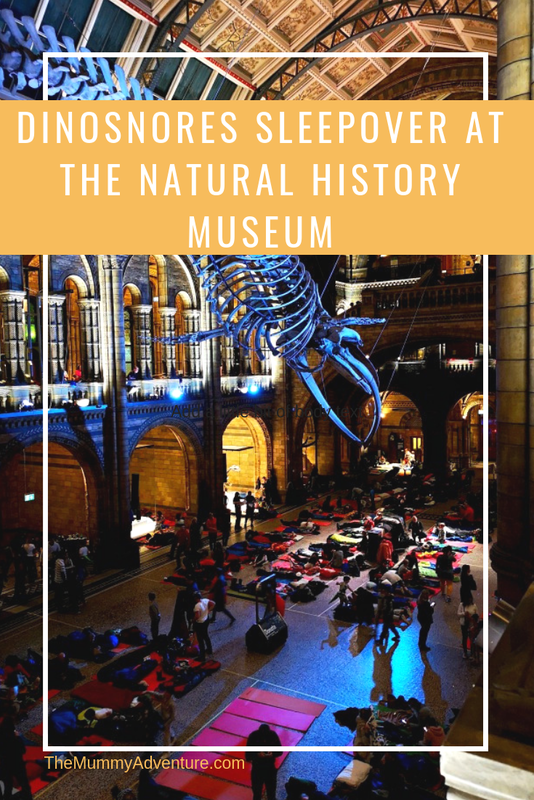 We had an absolutely fantastic experience at the Dinosnores sleepover event and I would really recommend it to anyone with a curious junior school aged child. Dylan was so happy and it was a great way for us to enjoy some one on one time together without his siblings. It would be a brilliant birthday party idea for a small group and there were beaver/scout groups there as well when we visited. 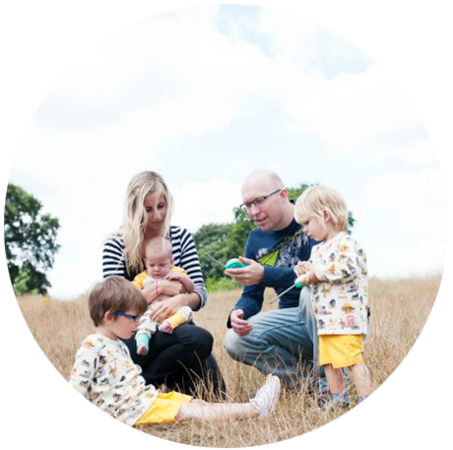 I hope that in the future I can repeat the experience with the other children although I will definitely be waiting until they are at least seven as it was exhausting and I want them to get the most out of it.